CWB Chicago: Staying after class: Five charged with trying to steal booze inventory from "Detention"
Staying after class: Five charged with trying to steal booze inventory from "Detention"
Five adults are charged with trying to steal the liquor inventory from Detention, a now-shuttered nightclub on the Division Street bar strip, over the weekend. Patrol officers who are assigned to the bustling nightlife district saw the burglary unfolding around 3:30 a.m. on Sunday, according to a police department source. Back-up units were called in to help with the arrests. 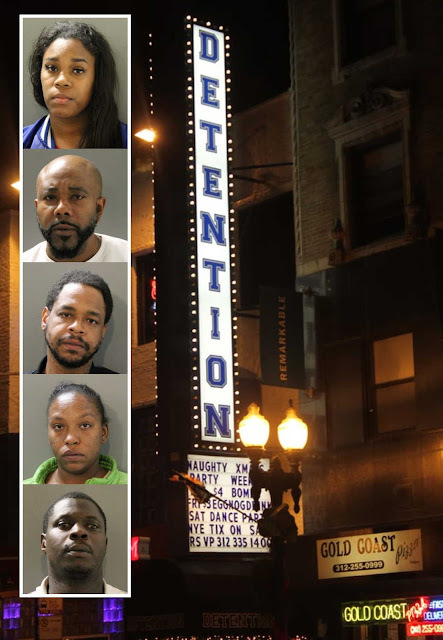 Police said 42-year-old Kennard Flowers, 35-year-old Monroe Thurman, 31-year-old Pierre Gantt, 21-year-old Robenique Collins, and Danielle Spivery were seen exiting the front door of the club at 9 West Division “in possession of various bottles of liquor.” Spivery’s age was not available. Prosecutors have charged each of them with one felony count of burglary. Bail for Flowers was set at $10,000, and a judge ordered him to be placed on electronic monitoring if he posts bond. Bail information was not immediately available for the other defendants.